The energy benchmark recovered yesterday as Trump’s push for a trade deal with China followed EIA’s stockpile report showing declines in gasoline, distillate and propane inventories. Though, gains couldn’t last long as doubts over global growth and strong US Dollar disappointed the buyers. Latest reports from the US-China trade front signals the US President Donald Trump is pushing the White House officials to clear a deal soon. The news becomes positive for the world’s largest industrial player, China, and in-turn for energy traders. However, sellers sneaked in during Thursday evening after the European Central Bank cut its growth forecast down and raised doubts over the global economic strength. Traders may now concentrate on today’s US employment report to determine the near-term market direction. Crude oil prices remained relatively intact after failing to break below the lower band. The price is now still trading just above it and precisely above the $56 level. 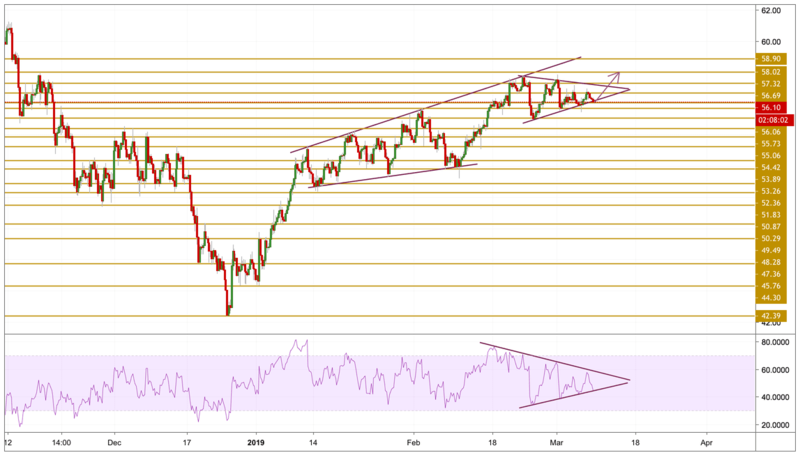 Momentum is turning bearish if this level provided the right support for the price, we will most probably witness a break to the upside and hence we will be focusing on the $57.32 level.